Visitors to Los Angeles are always in awe of the number, scale and permutations of billboards across the city. To those who live here, they can often be lost within the urban sprawl. Because of this, its worth checking out some billboards of interest – and the reasons they are compelling. The buzz surrounding the final season of the series, BREAKING BAD, is deafening. Even those “in the know” folks in LA are plainly not when it comes to this television show. Is the lead going to live or die? Is the antagonist’s DEA agent brother going to bring him down, or vice-versa? The anticipation for the final story is of the same level of that other popular show where everyone was rooting for the antagonist, HBO’s THE SOPRANOS. 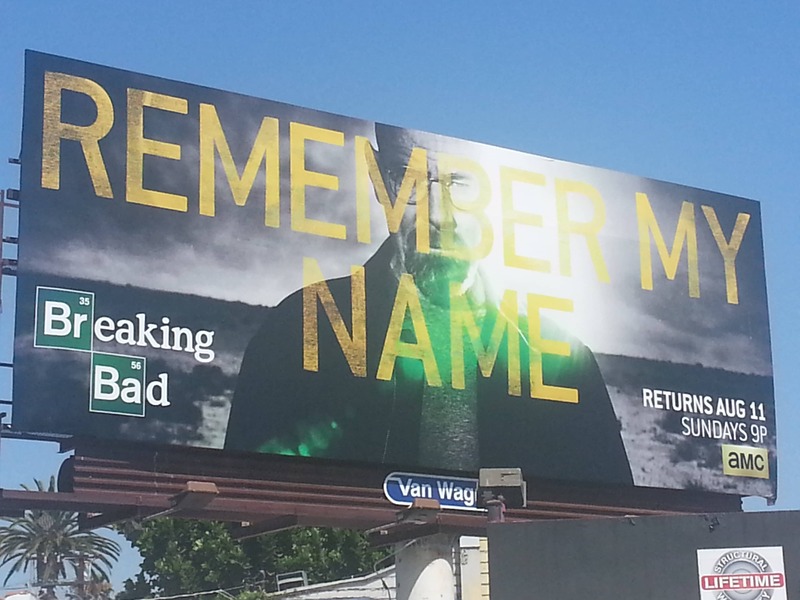 Which leads to a billboard seen around town for BREAKING BAD. With the image of the main character, the marketing team was judicious in their copy – keeping it short, sweet and with absolutely no answers! Whether they meant it or not, the words could be conveyed in so many ways – from that of a drug kingpin demanding respect and immortality to the invocation of a song from the 80s version of FAME (I’m going to live forever.) To me, it’s a perfect billboard in imagery, copy and information. Angelenos are also used to billboards conveying insider information. For instance, you can easily figure out the paths that studio heads take to their offices as their studios’ billboards, bus sides and others are always on that route. Of interest was this Dos Equis billboard with the quote “He can get from the valley to Venice in 14 minutes.” Certainly, the quote works for a location-specific audience who constantly trades in how long they can get from one part of town to another. But this one intrigued me for another reason. Though I’ve never met Jonathan Goldsmith, the actor who portrays The Most Interesting Man In The World in the Dos Equis commercials, I do know that he lived in Marina de Rey and the Venice area when the spots started in 2006. With that understanding, I wouldn’t be surprised if the marketing team got the idea from a casual discussion with Goldsmith. I could imagine Goldsmith brashly stating that he could get from the Valley to Venice in 14 minutes – and a billboard quote was born. Of course, my assumptions about both billboards could be completely wrong – which only proves how much the viewer’s perception plays into these large format advertisements… Stay Marketing, My Friends.